A Maldivian musical on water and a cultural village perched high on the beach were the highlights of the spousal retreat held in Fuvamulah today. Fuvamulah, co-host of the 17th SAARC summit along with Addu City, has been the venue of activities for the SAARC Festival since the start of November. These have included a kite festival, bashi competition (a game played exclusively by women using a badminton racket and tennis balls), and the ‘Cricket 20Twenty Cup Tournament’ among seven SAARC member nations. Beach volleyball and futsal tournaments meanwhile took place in Addu City. “We are very happy to be part of this SAARC summit as this will open Fuvamulah to the world. Our famed thundi (southern beach) and the beauty of this island will be visible for all to see” said Ali Zaeed, Fuvamulah Councillor, ahead of today’s events. Fuvamulah is located in the south of Maldives near Addu City, which together makes up the Southern Province. Fuvamulah is both an atoll and an island and is geographically considered to be one of the most unique islands in the Maldives, with two fresh water lakes and beaches lined with black stones, white flat pebbles, white sand and rocks located on different sides of the island. “Indian prime minister Mr Manmohan Singh’s wife and Sri Lankan president’s wife along with spouses of foreign ministers present…is expected to come to Fuvamulah in the afternoon tomorrow” said Zaid last week. Though preparations for the spousal retreat were in full swing during the week, Zaid expected the preparations to be completed on schedule. The spouses flew into Fuvamulah on the day that the first scheduled flights started in the newly built domestic airport. 200 secondary students performed a welcome dance near the tarmac of the domestic airport. A rehearsal of the events took place on Tuesday with first lady Laila Ali in attendance. The dance choreographed by Munko featured a traditional dance to the song ‘Rashu Vehi’ (Island environment). The song is the first three couplets of an old Fuvamulah poem extolling the virtues of the island and its uniqueness. After arrival the spouses proceeded to the biggest lake in Fuvamulah ‘Bandaara Kulhi.’ A newly built platform offered a splendid view of the lake where a romantic Maldivian musical was displayed. “Performers in 11 boats in traditional attire, will depict a love story, which will show a couple falling in love, the pain of separation, before finding each other again,” said Mifraah (Mifu) Abdul Muhaimin, Fuvamulah coordinator for the official event, speaking to Minivan News last week. “Fuvamulah has been isolated for very long, so once the hero leaves, he can’t come back easily,” Mifu said. Coordinating rowing boats for a performance was not an easy task, though the performers from all walks of life, and ages were very enthusiastic about the musical. Though the one thing they all have in common is that they know how to swim, essential for a performance over water. The musical takes inspiration from the story of Dhonhiyala and Alifulhu, Maldivian equivalent of Romeo and Juliette. The soundtrack was a fusion of Maldivian songs and old forms of poetry. Among them Raivaru, a form of poetry that takes place as a dialogue between two or more people and that was used in the past to woo prospective partners. “We have made sure that we use traditional garments and authentic stuff for all the events,” said Mifu. The southern beach of Fuvamulah was the last stop for the spouses. The wide beach famous for its beauty is made up of small flat white pebbles in contrast to the white sandy beaches commonly found in Maldives. The cultural village is on the high end of the beach with eight thatch roof huts that depicts Maldivian life of yesteryears. “We did a lot of research to get the authentic look of each hut,” said Ali Amir, who did the concept and design of the village. MNDF created the village based on a detailed sketch of the village. Research consisted of reading what little written account was available and in reference to oral history. “We talked to elderly people in this island. This required a lot of patience as some of them are very old and sick in some cases, so we had to meet them at times convenient to them” said Amir. The antique furnishings inside the huts, like ashi (bench beds), swings and a 200-year-old farivalhu (container decorated with lacquer work used to serve food) among others, were sourced from different houses in the island. The village consists of hut of fisherman, farmer, blacksmith, island chief, edhuruge (house of the only teacher) and places like a boat building hut, a yam storage place and hut of a Vaaruveriyaa (governor from central government). The latter vaaruveriya was the person charged with governing individual islands for a brief time in history until Maldives became a republic in 1953. “The sultan would send an edict to a person he chooses appointing him as the Vaaruveriya of that island” said Ali Didi, the consultant for the project and Fuvamulah island’s resident history expert. From that moment the Vaaruveriyaa would take charge of the running of the affairs of the island and trade from the comfort of his own house. All produce of the island, be it vegetables or fruits from trees in islander’s own backyard, had to be presented to him. “He would not have a fixed income, but would get to keep 1/10 of all items he trades,” Didi explained. “Most of us live in a concrete jungle now, it’s a respite to go back to the days of the past, and see the simple life again” said Amir. The retreat come to an end with evening tea served Shiranthi Wikremasinghe, soaking in the simplicity of Maldivian lifestyle in a cultural village in one of the most beautiful spots in a unique island atoll. Minister for Economic Development Mahmood Razee inaugurated the Hubasaana 2011 Arts, Crafts and Food festival in Maradhoo Feydhoo of Addu City on Thursday, October 20. The festival, which was organized by Ministry for Economic Development (MED), will be a platform for Small and Medium Enterprises (SME). The fair, which runs through October 22, is the culmination of a yearlong pilot project for developing local products that was conducted in the South and North of Maldives. “The festival will showcase authentic high quality Maldivian products,” said Hamza Imad, MED’s international consultant for the project. In addition to the display of local products ranging from handicraft and woodwork to food produce, there will also be demonstrations of the making of regional delicacies like bondi (a sweet made of coconut) and kudhi gulha (fried short eat). “The project will be expanded to other areas of Maldives next year,” said Imad. Over 50 SMEs of nearby atolls GA, Gdh, and Fuvamulah are participating in the three-day festival, along with Addu City. Hubasaana 2011 will also be held in Hanimadhoo of Hdh atoll in early December. The event will enable SMEs from the northern atolls of HA, Hdh, Shaviyani to participate and promote their products. Aishath Raniya Sobir, Monitoring and Evaluation Consultant for MED’s Private Sector Development Project said two Business Development Service Centers (BDSC) were set up last year in Hithadhoo of Addu City and Kulhudufushi of Hdh, to facilitate the project’s operations. The trainings were an important outlet for a thriving talent pool. “The islanders are very enthusiastic and talented, and a lot of time the people who came for the trainings had already been doing some handiwork as a hobby,” said Raniya. One such person is Addu City housewife, Mariyam Naazly. Naazly had attended various handiwork courses over the years. During a fabric painting course, Addu’s BDSC consultant gave a talk on start-up business cooperatives. Naazly said the talk motivated her to become an entrepreneur. Joined by 10 other attendees of the course, Naazly formed the Addu Arts and Crafts Cooperative Society (AACCS), of which she is the president. The cooperative creates handicraft, like baskets of eekle broom, coconut art, bracelets from nuts found in trees and decorative items from empty rice sacks among others. Discussion among islanders has innovated the crafts market. “A participant brought a lions head done in from a pillow case, and we oriented them towards making things that exist in Maldives,” said Imad. The result was a totally new product on the market: a stuffed replica of Maldivian marine life including eels and sharks, that can be taken home as a souvenir. The cooperative’s first workshop was held in a friend’s sitting room. Now, they share a workspace along with another cooperative provided by the BDSC. “I am also attending marketing classes at the center, for the first time I can actually make a living out of all the things I have learned,” said Naazly. The BDSC is providing a unique professional opportunity for women, the majority of whom don’t work in the Maldives’ lucrative tourism sector due to social and religious expectations. Of the BSDC trainees, 40% have been women. In a country that creates very little, starting a project like this had not been easy, stakeholders said. Imad and Raniya said bureaucracy and administrative work had proved to be very difficult in the initial phases. “We had to go for a change of mindset on the way people do business,” says Raniya. But change can be a difficult lesson. “Market needs, tourist needs, we had to teach people to take this into account,” explained Raniya. Speaking of a popular Maldivian snack common in most cafes, Imad identified customer control of food as a new concept. “We can do frozen short eats, so that a person can grill it or fry it when they want to eat it,” said Imad. A total of 60 new businesses have been started via this project, including set up of businesses and cooperatives for agriculture, arts, crafts, hydroponics, aqua culture, food processing and packaging, wood carving and goat rearing. PADI open water certificates have enjoyed new popularity–80 locals signed up for the course. “The demand was overwhelming and we couldn’t accommodate everyone,” said IMAD. “We asked the participants to bear 20% of the costs while the government bore 80%.” Maldivians with PADI training is expected to be a huge asset to the mid-market tourism envisaged by the government. Meanwhile, barriers between locals and resorts persist. “locals would complain that resorts had no interest in buying their product, while resorts would complain about the quality and consistency,” Raniya said. To bridge that gap and achieve success, MED joined efforts with the Ministry of Agriculture, the Ministry of Tourism, UNDP and the International Fund for Agricultural Development (IFAD). “We also had a lot of help from Women’s Entrepreneurs Association, especially its former president late Aiminath Arif,” said Rainya. A bill that has been submitted to parliament could end up giving a huge boost to the newborn SMEs and change the face of the souvenir market in Maldives, which is at the moment flooded with foreign products. “If the Micro, Small and Medium Enterprises Act is passed, within 3 years 50% of products in all souvenir shops should be local,” said Raniya. Hubasaana 2011 festival will be held Maradhoo Feydhoo Social Centre in Addu city on 20-22 Oct 2011, at the SAARC Summit in Addu City from 8-10 November, and in Hanimadhoo of Hdh Atoll from 1-3 December. Prominent Chinese artist Yuan Xikun says that during the tumultuous times of the Cultural Revolution, “to escape the meaningless fight between people” he went off and lived in the wilderness like Robinson Crusoe. Even though he had been selected to stay in the city to paint the portrait of Chairman Mao Zedong, Xikun requested to be sent off to rural Xishungbanna. Life in the wilderness provided fodder for his paintings. In particular an encounter with a tiger at close range had a major impact on him, influencing his art. His paintings of tigers are many; specially striking is one titled ‘Mountain Gentleman’ of a tiger’s unflinching stare in an Oriental Canvas. “When I came across it in the forest it became a staring match and then luckily it walked away,” says Xikun, speaking through a translator at a talk he gave Monday night at the National Art Gallery. The new Chinese Ambassador to Maldives Yu Hongyao and Deputy Minister of Tourism, Arts & Culture Mamduh Waheed attended the talk along with Maldivian artists. Eleven paintings by Xikun, of tigers in various poses, were on display at the art gallery. One of a small Chinese boy next to a docile tiger lying on its paws is aptly titled ‘Tiger tamed by boy with magic powers.’ The magnificent creature evokes sympathy in the viewer in the painting titled ‘Waiting for home’ a forlorn tiger seen through the bars of its cage. The tiger is also what has lead Xikun to come to Maldives. Xikun, who is also a world-renowned sculptor, is the United Nations Environment Programme (UNEP)’s Patron for the Environment and Arts. UNEP uses Xikun’s sculptures for its environmental Champions of the Earth trophies – one of which was received by President Mohamed Nasheed. A keen environmentalist, Xikun says it was inspiring to see the President doing something about carbon emissions. A tall striking figure, Xikun took the attendees through his work via a power point presentation while talking animatedly in Chinese. “You might ask why bring paintings of tigers to an Oceanic country. The thing is sharks share a similar destiny to tigers in the environment.” Xikun regularly uses his art to highlight threats to the environment and remind the viewers that the Earth’s resources are finite. A miniature of his famous sculpture, ‘Urgency of the polar region’ was also on display. The sculpture of a mother polar bear balancing a top an iceberg with its two young cubs clinging to its side highlights the dangers of the melting icebergs. Xikun says it is in recent years environmental awareness has become such a large part of his philosophy infusing his work. Though his interest in painting ink wash portrait of foreign dignitaries and leaders had also earned him the title of ‘portrait diplomat’. So far he has painted over 152 portraits including that of Nelson Mandela. He has also produced sculptures of Einstein and Gandhi, along with 158 world leaders in politics and arts. Xikun is also the founder and curator of the first private museum in China, the Jin Tai Art Museum in Beijing. Xikun is gifting the three miniature sculptures he brought to Maldives. Among them is one titled ‘Sky patch.’ After the talk he explained that the sculpture of a woman carrying a rectangle block in her outstretched arms had originated from a Chinese myth about a goddess that blocks a hole in the earth. “This is relevant to today’s times because we have a desire to do something about the environmental problems we face.” The other sculpture is that of Napoleon holding on to St Helena. It was an unusual scene. Some of the most popular musicians, DJ and audio artists mingled with amateur musicians doing a rhythm exercise. The stomping of foot and sound of clapping hands were punctuated only by the sound of kass kass, a versatile rattle that originated in West Africa, used as a form of percussive expression, played by French musician Johann Berby who led the exercise. At his prompting the rhythm changes again. Berby along with Theo Croix is conducting a sound workshop in conjunction with Alliance Française and Island Music. Once the exercise is over all the participants sit back for what seems like music lesson interposed with life lessons. It is Berby’s concept of sharing musical knowledge that proved to be a catalyst for the first ever-sound workshop to be held in the Maldives. The workshop of three days started on September 19 with 80 participants, and is aimed at improving the sound quality of music in Maldives. “After performing in Maldives last year with the famous Cameroonian singer Blick Blassy, Berby proposed to us to hold a sound workshop here,” says Pauline, the directrice of Alliance Française Male’ (AFM). Berby a talented bassist who tours with different musicians, followed up on his offer by sending a proposal, and offering to do the workshop for free. Seeing there was a need for such a workshop AFM organized it. “Lets just say getting the sound right was difficult,” says Berby of his live performance with Blick Blassy last year in Artificial Beach. According to him good musicians can make the music sound better if the sound base is good. A sentiment echoed by Island Music. “We had been thinking for a long time of holding a sound workshop, and this initiative by Johann and AFM came at the right time for us,” says Azmi Jaleel, Chief Operating Officer of Island Music (IM). As a company that also has a sound reinforcement arm in addition to being distributors of music instruments in Maldives, IM had faced difficulties with live shows. Recognising the need for such a workshop, Detune part-sponsored the workshop along with Lintel, Bandos, Mookai, Bowers & Wilkings and Beamon. Both Fezleen and Jaleel pointed out that the workshop also allowed musicians to mingle on an even platform. “It’s a very diverse group here, apart from musicians we also have people from TV and radio stations, and also individual producers and enthusiasts of music,” says Jaleel. One such individual is rising hip-hop music producer Mohamed Yasif (Yes E). Despite having produced two local hit video songs, ‘Parteys’ and the catchy number ‘Reethi Kudhin,’ Yasif acutely feels the need to learn more. “I learn via Internet, buy music courses off it and follow them.” However he laments that these courses allow for very little practical knowhow. In the absence of good music schools, workshops like this are a lifesaver according to Yasif. The workshop had both physical and theory lessons, and included aspects on how to make sound better in live shows and in studios. Berby hopes to come back and conduct more workshops, amid plans to hold them in other Asian and African countries that do not have music schools. “Next time I would like to do a workshop, on music of different continents.” He advises Maldivian musicians to dip into their culture and roots for inspiration, to make unique music. Amid a debate between participants and Croix on how good MP3 songs could sound, Jaleel says IM also believes this is the start of many more workshops. Paintings by three Maldivians are among the diverse artworks displayed in the international art exhibition ‘OneArtOneEarth’ in East Africa. The ongoing exhibition takes place at Diamonds La Gemma dell’Est, a five star resort on the western coast of Zanzibar, and showcases paintings of Maldivian artists Hassan Ziyad, Huda Aishath and Afzal Shaafiu Hassan (Afu). Contemporary paintings by artists from Tanzania, Kenya, Uganda, and Sri Lanka and Zanzibar are among the other works displayed in the exhibition. “It was a very good opportunity for us as normally we get to interact only with artists from the SAARC region, this has enabled us to see the works of some superb African artists, and exchange notes with them,” says Afu. Huda and Afu were flown to Zanzibar along with other artists for the opening night of the exhibition in late July. Minister of Tourism, Arts and Culture, Mariyam Zulfa along with her Zanzibar counterpart Minister Jihad Abdillah Hassan were chief guests at the event. Most painters had integrated their cultures on the canvas of their paintings. Saada Juma Mussa, one of the leading henna painters in Zanzibar, showcased the art form on canvas. A former banker Adrian Nduma from Kenya plays with colour and abstract forms on his canvases, giving way to a magnificent painting of a lion. 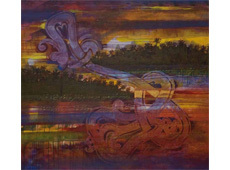 Likewise the Maldivian artists incorporated aspects of the Maldives in their paintings. On the opening night itself one of Huda’s paintings were snapped up by a patron. A former art teacher at Iskandar school, Huda says her artistic mother influenced her to start painting at a young age. “After experimenting with different techniques, I have found that bold strokes of oil and acrylic on canvas is something I never get bored of,” says Huda. Those bold strokes created an alluring painting of a woman in a red Dhivehi libaas (traditional Maldivian dress) walking towards the sea, one of the first paintings to be sold. Huda, Afu and Ziyad’s work, were chosen from among a dozen Maldivian artists, by Carlo Cipolini, the organizer of the event. Cipolini, a successful hotelier and owner of PlanHotels, is also an art aficionado and had held this exhibition to inaugurate his ambitious art project ‘The Indian Ocean Art Project’, which will bring together artists from in and around the Indian Ocean region. “The aim of the project is to promote the teaching of art and to support artists from Indian Ocean Countries,” says Cipolini. Akin to art movements in the past, the project aims to create an art movement in the Indian Ocean. Spherique will promote different forms of art, including painting, design and sculpture. An annual international art exhibition will be held to showcase local artists and give them maximum exposure. Artists will be encouraged to share their experiences and travel to other countries to connect with different traditions. “Artists of countries located in and around Indian Ocean will be able to compare notes with each other and give free reign to their talent,” says Cipolini. Despite the influx of thousands of tourists annually to the Indian Ocean countries, the local art scene has not been able to fully utilise this platform to promote their art. International airlines, TV networks and companies alongside governmental authorities of the participating countries will partner in this project which will see the emergence of art galleries and businesses based around art in the participating countries. Spherique will bring together countries as diverse as Seychelles, Myanmar, Comoros Islands, Mauritius, and Yemen with a variety of existing art forms. Among them are South Africa, Tanzania and Kenya gifted with ancient legacies; Australia which is home to one of the world’s oldest continuing art tradition, aboriginal art; and India and Maldives with their burgeoning youth populations that produce experimental work, showcasing their cultures on canvas in distinctive ways. “This will be the strength of the project, that the love of art will bring together people from different backgrounds, to form a melting pot of ideas, styles, concepts and culture” says Cipolini. ‘Spherique’ launched with much fanfare, heralds in a new era in art for the countries involved. This pan Indian Ocean project has all the potential to create an Indian Ocean art renaissance and give talented, hitherto unknown, artists a chance to become an Indian Ocean Matisse of tomorrow. There are certain paintings that have the power to uplift your spirits. Well-known local artist Afzal (Afu) Shaafiu Hassan’s Coco collection exhibition showcases 24 paintings belonging to that category. Commissioned by Cocopalm Boduhithi, the acrylic paintings are destined to be hung in the water bungalows of the high-end resort. The paintings’ blend of contemporary and heritage gives a modern twist to usual depictions of palm trees, corals, shells and islands. At the same time Afu’s paint brush has also dipped into the 2000 year old Maldivian culture, giving the paintings depth, familiarity and a unique ‘Maldivianness’. The 48×44 inch paintings are hung in a row, inches apart occupying one side of the spacious art gallery. Interestingly enough a 60 year old Maldivian story ‘Raiveribeyaa Rukaa’ (toddy tapper and palm tree) written by Annabeel Malin Mohamed Didi runs through all the paintings in the form of a monologue written in ancient Dhivehi script. “It was a coincidence; I was reading that story when Cocopalm commissioned my work,” says Afu. The story goes on to highlight the importance of the palm tree to every aspect of Maldivian life and talks about how it is better to protect the palm trees than damage them. The quintessential palm tree and sunset has a new role to play in Afu’s paintings. In one painting two palm trees stand straight on the right side as all around them, blues, oranges, purples intercept and whirl around. While on the left side one can almost make out the faint whisperings of a form that looks like a butterfly or a flower, the ends of it curling and beckoning the palm trees. “It’s the flower motif you find on lacquerware,” says Afu, and suddenly you realize why the form looks so familiar. Throughout all the paintings ancient motifs plays peek-a-boo with the viewer, teasing in its familiarity. Afu’s depiction of murex shell is almost fiery, the edges spiked with blues, oranges, and yellows, reds, pinks – it is simply a riot of colours. The shell’s middle is mysterious and dark reminding you that you never really know what lurks inside a shell when you pick it up first. In contrast to the fieriness of the shell is the barely visible flower motif at the bottom. In other paintings you can make out a hexagonal seal, akin to the ones used in the past by Maldivian Kings. “The motifs and seals are not depicted exactly as they are,” he says. In Afu’s world flower motifs are stretched, a king’s seal gives way to your own and motifs from the ancient Friday mosque can be turned upside down, or lengthened and modified in innovative way to break up two juxtaposed island views. Calligraphy recounting ancient stories run horizontally, vertically, in one lines, or in couples to visually entice the audience. A view echoed by Hussain Hilmy, director of Sunland Travels that owns Cocopalm Boduhithi. “We decided to source local painters because there are many talented artists in the Maldives. It was tough choosing an artist, after seeing the works of so many,” he said. Speaking at the opening ceremony of the exhibition last night, Hilmy emphasised the fact that the paintings would be hung in the most expensive rooms of the resort and wished more progress for the local artists. This is the second resort commission for Afu, a 12 year break after the first one. “The tourism industry has an obligation to help develop the local artists, as it would be mutually beneficial for both industries,” says Afu. Coco Collection will be on display until July 14 every weekday from 10:00am to 4:00pm at National Art Gallery. The Maldives Inland Revenue Authority (MIRA) has taken a door-to-door approach in trying to prepare Maldivian enterprises for the introduction of a new Business Profit Tax (BPT) that comes into effect on July 18. MIRA says informing and registering every national enterprise in the country under the scheme will be a considerable challenge. The BPT is to be charged to all businesses operating in the Maldives,that makes a profit of more then Rf500,000 (US $32,425). The tax will be a first for companies operating in the Maldives, a country that launched a similar 3.5 percent Tourism Goods and Services Tax on all travel industry income as of January 1 this year. Business owners and industry representatives, while said to generally welcome direct revenue in the country, have called for a gradual introduction of financial reforms like the BPT, which are being sought by the government to balance national budget deficits and protect smaller enterprises. Under the present BPT system, businesses that make a profit of more than Rf500,000 (US$32,425) will be asked to pay 15 percent of their earnings to the state. This sum will effectively rule out small businesses operated by individuals and places like corner shops that mainly caters to the local residents from having to pay BPT. Moomina Abdul Sattar, 49, who runs a small tailor service, is one such businesswoman. “I don’t have to pay the BPT tax; it is applicable only for those who make a profit of more than Mrf 30,000 (US $ 1945) a month,” she said. Sattar added that she had previously attended an information session held by MIRA and was not therefore concerned about the tax as it does not affect her operations. “My income per month is around Mrf 15,000 (US $ 973), from this I have to pay the salary of my three tailors,” she said. Nonetheless, Sattar added that she still wasn’t aware that registration of her business was required by MIRA, even after attending the meeting. For other businesses in the country, beyond the registration process itself, BPT is still expected to provide a significant challenge, at least in the short-term. “We are not fully ready for BPT, but we are taking it positively,” said Ibrahim Hameez, Managing Director of Ryan Pvt Ltd. A design consultancy firm, Ryan has about 40 employees and would be seen as a medium and growing business. “A lot of things that affect businesses were introduced this year, pension scheme, BPT, Income tax,” he said. The BPT Act was published in the government Gazette on 18th January, with the tax to come into effect 6 months from the date of publication. As part of the act’s requirements, businesses of all sizes, including small and medium enterpises have to be registered with MIRA. This is a first for the Maldives, where small businesses run from home have generally not had to register themselves in the country. MIRA says they are having great success in their door to door campaign to spread awareness. “The response from the public has exceeded our expectations, people are very cooperative and even fill up the forms for registration on the spot most of the time” said Fathimath Rasheeda, Director of Tax Payer Education and Facilities for MIRA. Landlords had also previously been exempt from having to register their operations or interests. It is these type of earners that Rasheeda has said have been the target audience for its door-to-door campaign. “As a society we don’t tend to think that renting places, giving tuition, or selling sliced arecanuts are doing businesses,” she said. Until this month, individuals or partnerships running small businesses like making short eats or cakes from their homes had only been required to get permission from the Ministry of Health to operate. Similarly, anyone renting accommodation, no matter the size, had not been required to register their property unless the place in question was to be used as a shop. “Even a person renting out one room for Mrf 2000 (US $130) or teaching a small Quran class should register. But we will be taxing only those who earn more than 500,000 (US $ 32425) annually as profit,” said Rasheeda. Alongside businesses, MIRA also has its own concerns over such a large scale operation being conducted for the first time. “This is a big challenge for us also, as this is the first time a lot of businesses in Maldives would be registered,” she said. MIRA’s 70 staff will be participating in an awareness campaign set for next Saturday. While next week the campaign will be taken to the islands. “Due to lack of resources we cannot cover all the islands, but the city and island councils have been very helpful and have helped register the businesses in the islands,” Rasheeda added. Among the challenges faced by MIRA will be taxing businesses that had never before declared their revenues publicly. The audit department of MIRA is expected to conduct a risk analysis to prioritize the first businesses it will audit to ensure the system is being adhered to. “We hope to audit all the businesses within a five year period. Those businesses and individuals eligible to pay taxes will be asked to file a tax return annually,” Rasheeda added. The Ministry of Health and Family has today condemned some islanders on Dhidhoo, Haa Alifu Atoll, for what it has called the “inhumane treatment” of a 13-year old school girl. The girl in question is an alleged victim of a sexual abuse case involving eight men, including two under the age of 18. The case came to light in April and was under police investigation. The Health Ministry has hit out at the reported treatment of the girl by members of the local community that have been accused of trying to block her from returning to public education. “Even if it’s the actions of a few, we are saddened to see that at a time when the girl is already undergoing physical and mental trauma, there are people who attempt to deprive the [alleged victim] of her basic rights and inflict more trauma,” the ministry stated in a press release. After a long period of absence from public education, the girl attended school yesterday. However, a group of islanders barged into her class and removed her chair in an attempt to get her out of school, according to local news service, Haveeru. She reportedly remained in class without a chair during the morning, and when she left school at interval time, the same group went and locked the entire building in an attempt to stop her from returning. Police confirmed that they had “received reports of the closure of the Dhidhoo School” and had later re-opened it. One local islander, who wished to use a false name to protect her identity, told Minivan News that there had been concerns about the alleged victim’s return to her school. “Most islanders object to the fact that she is able to go back, while the school goers among the male suspects involved in the case are barred from [attending],” said Aiminath Sheenaz,18, a resident of the island. Sheenaz said that when the abuse case first came to light, after a couple of days the girl did attend school. However, she added that disturbances created by some islanders had led to her staying home. “The Ministry of Education informed the school to take her back that’s why she was in school yesterday,” Sheenaz claimed. The principal of Dhidhoo school, Hussain Badheeu, was not answering calls when contacted by Minivan News and was unable to confirm the reports. However, according to the press release published by the Health Ministry, the school had asked the alleged victim’s parents not to send her to back until the investigation was complete. Despite the ministry’s verdict, Sheenaz said that some islanders believed it remains unfair that the alleged perpetrators can’t attend school. “It was consensual. She did all that, fornicated with so many men,” she added. Although being closer in age to the alleged victim, Sheenaz claimed she was also convinced of the 13 year old’s “willing participation” in these acts, adding that this was the prevailing belief of most islanders also. When the eight men suspected of having involvement with the case were first arrested, a group of islanders protested and called on the police to release the group that resulted in clashes. Asked if attitudes about the case were likely to change in the future if the court case went on to prove that the male suspects had sexually abused the girl, Sheenaz was adamant that it would be impossible. “A lot of people have given assurances that the girl agreed to the sexual acts,” she said. The fact that these assurances apparently originate from the alleged suspects themselves does not seem to make a difference to these attitiudes. The President of Dhidhoo council declined to comment on the issue when contacted by Minivan News. However, it is believed that both the suspects and the victim are presently living on the same island at present. Police Sub-Inspector Ahmed Shiyam said that the suspects implicated in the case were freed after a court had ordered their release. The sub-inspector added that the investigation had now been completed, with the case expected to be sent to the Prosecutor General’s (PG) office very soon. Shiyam said that the reported disturbance that occured in Dhidhoo concerning the case would be investigated and action taken against anyone who threatens fellow members of the public. The Health Ministry has also bemoaned the lack of organisations such as NGOs advocating the rights of the alleged victim or voicing concern about the treatment she has received on her island. Official police figures given to Minivan News this week indicated that a total of 163 sexual abuse cases were reported last year. By comparison, the same statistics also revealed that 108 sexual abuse cases had been reported up to the end of May 2011. According to these figures, 30 of these cases allegedly involved victims aged between two to 12 years. Addu City Council has announced plans to kick-start a project aimed at attracting mid-market tourism to the region in a change of policy from the country’s established one resort per island policy. Following in the footsteps of developments on the island of Gan in Laamu Atoll, Addu City authorities have said they will develop areas of the city as a Asseyri (Beachside) Project. The project represents a tourism development plan by which guest accommodation, alongside recreation and entertainment facilities, will be developed in a specific area with each commercial component being rented out to different parties. The system differs from the country’s established tourism model that has generally been based on a single enterprise operating a resort property exclusively on a designated island. The announcement of the Addu City project follows a cabinet decision made earlier this year to create an integrated tourism development policy. “We have identified the areas we want to develop for the Asseyri project, and we have sent the proposals to the Tourism Ministry for approval,” says Abdullah Sodiq, Mayor of Addu City. The two areas ear-marked for development under this project are the Maafishi Area of Hulhumeedhoo Island and the start of the Hankede area, Hithadhoo. Moving away from the existing one island, one hotel tourism product, an Asseyri project aims to open up venues to allow larger numbers of local entrepreneurs to participate in the Maldives’ lucrative tourism sector. The project will also open up doors for budget and mid-market tourists to visit Maldives, diversifying the Maldivian tourism product, according to developers. A pilot Asseyri project was launched by the Tourism Minister Dr Mariyam Zulfa in Gan in March. According to the proposed plans, two 300 bed hotels, 69 guest houses, as well as a number of restaurants, spas and sports/recreational facilities will be developed on the 25 hectares of land located on the western beach side of the island. The proposals for the Addu project have now reportedly been drawn up and sent to the ministry for approval. “The tourism ministry shared with us the details of their ongoing project at Gan and has been very supportive of our maiden venture into this area,” Sodiq said. Addu City Council hopes the project will give a boost to the local economy by creating more job opportunities and helping with aims to increase the GDP of Addu Atoll within the next three years. It will also attract more visitors to the city which is already home to properties like Shangri-La’s Villingili Resort and Spa. Tourism authorities in the country have also pledged to try and assist the Addu City beach-side developments. “We are holding discussions with Addu City Council to plan their Asseyri project,” says Moosa Zameer Hassan, Deputy Director General at the Planning Department of the Ministry of Tourism, Arts and Culture. Hassan added that the Tourism Ministry was currently working to change its approach to the Gan Asseyri project after evaluating project proposals that were submitted ahead of a June deadline. “We received two proposals, one from a local company to do the water and sanitation component of [the project], the other from a foreign company to develop the hotel component. At present we are negotiating with both parties,” Hassan said. The initial idea for the project was to try and find a party interested in the total development of the whole area and to lease out the different components of it afterwards, though tourism authorities are now reviewing this. “The area is very big that might be the reason [for the review]. So now we are going to put out a tender for the development of hotels and guest houses, and hold discussions with the local council for them to rent out the land plots for other components of the project like restaurants, spas, recreational facilities and such,” Hassan claimed. Aslam Moosa, a representative for Gan Island Council said he and his fellow members had been kept in the dark regarding the project. “Yes, I have seen the area marked on the map, and heard the announcement for the proposals, but nobody has held discussions with us on the project,” he added. Moosa claimed that the council was presently only involved in the development of a 300 bed hotel by an Indian Company in Gan. Hassan confirmed that discussions have not been held since local councils were elected. in February. “But we hope to hold discussions with them and to be able to rent out plots of land within two months,” he said. While the tender for hotels would be open to foreign parties, bidding for running guest houses will be only for locals, Hassan stressed. Meanwhile, Addu City Council has said it is finishing up the administrative work for the Asseyri project and would soon be drawing up the final plans. The tentative date to complete the tender for the Addu Asseyri project is by September. However, Sodig says actual physical work on the project will be put off until December, to enable the scheduled 17th South Asian Association for Regional Cooperation (SAARC) summit to go without any hitches.